It is not unusual for me to feel like an outsider. I am never sure if this is just a function of being a shy person, the remnants of the experience of being a young immigrant, or if I simply revel in an oppositional stance. Perhaps it is a mixture of all these things, or maybe one thing just leads to another. Like a lot of outsiders I have always been drawn to the arts and underground music. One of the great ironies of oppositional culture is how strongly it creates a sense of community, a small group of insiders believing they are on the outside. Everyone likes to chuckle about how you can always tell who the weirdoes are because they all dress the same, as if spurning one community ought to mean you have no desire for another one. But, there is something nice about walking into a room full of people who might share your ideas, tastes and interests. I think this is one of the appeals of gallery openings. I think it goes without saying that a gallery opening isn't necessarily the best environment in which to actually view art. However, it is a great way to feel part of some kind of community, even if the group of people doesn't change much from one event to the next. So, it was a strange experience to walk into the opening of Megan Rye's "Long Night's Journey into Day" at the Chambers Burnet Gallery a few months ago. To get to the gallery itself you have to walk through the relentlessly chic bar and lounge, past works of art by Damien Hirst,Yasumasa Morimura, Evan Penny and others. The mild sensation of being out of place here was mainly amusing, like walking onto the set of someone else's movie. What was truly strange, though, was walking into the gallery opening itself. I go to a lot of gallery openings, and have become used to a group of familiar faces that crop up at all of them. I guess I am one of those faces, too. In this group I didn't recognize a single person. The room was packed, making it close to impossible to really see the work. It was also pretty clear that the room was filled with folks at the opposite end of the economic spectrum from me. These were clearly potential art buyers, and with individual works selling for more than my annual salary, I guess it's not too surprising that there seemed to be so few of my usual peer group in the room. I didn't last long in there. I was reminded of this experience as I walked into the opening of Andréa Stanislav's new exhibition, "Holiday in the Sun," also at the Chambers Burnet Gallery. Here was a room full of familiar faces, quite the opposite of my previous experience. In some ways the work matched the chic tone of the venue, all shiny glittery surfaces and effortless cool. The majority of the pieces could nominally be described as paintings - relatively two-dimensional, brightly colored, wall mounted works. 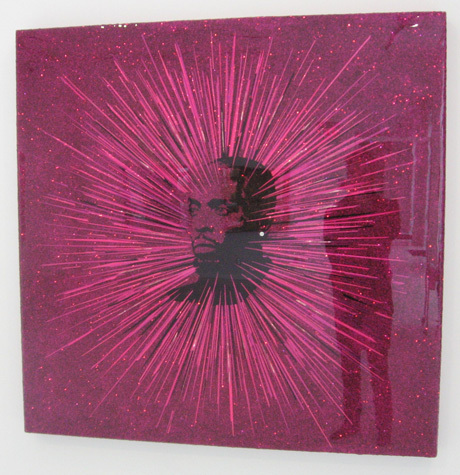 Each of these is apparently built up of layer after layer of resin, with multiple layers of glitter adding a sense of depth to their depthlessness. Also encased in the resin are iconic words and images, lyrics from punk songs, names of celebrities and artists, and references to cult film and TV. 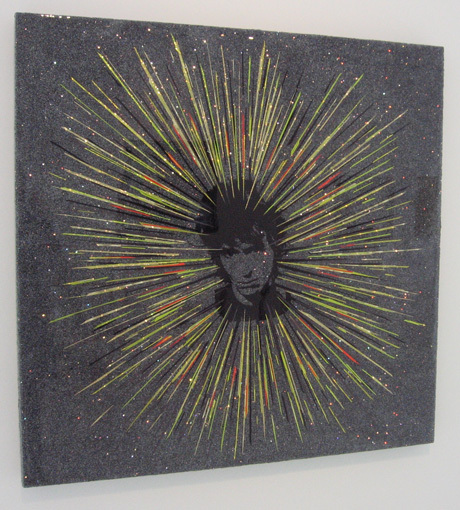 Johnny Thunders' face makes an appearance, as does Omar from the Wire, both given the aura of secular saints, surrounded by glitter and halos of radiating lines. The title "What Would Omar Do?" only serves to underscore this pop-religious feeling. Each of the celebrities celebrated here seem to icons of opposition, and the lyrics quoted are all classics of oppositional culture. The installation could be read as a celebration or canonization of these cultural touchstones. Doubtless many people viewing the exhibition will experience the joy of recognition, perhaps some teenage nostalgia, and that warm feeling of inclusion and community. However, despite the gloss and glitz, I found the work to be relentlessly bleak. Maybe this was all happening in my head; I am not sure how much is really the work's intention. The slick and shiny images, as well as the posh surroundings, seemed in sharp contrast to the subject matter - the underground beautified and commodified, beatified and memorialized. I found my mind drifting to a vague memory of the bleakness of Adorno and Horkheimer's essay "The Culture Industry: Enlightenment as Mass Deception." 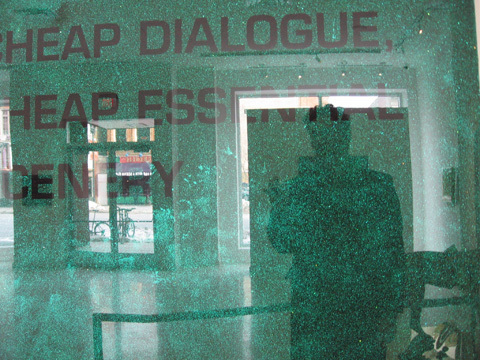 You'll have to forgive me for not re-reading it on my day off, but one of its main points is that all cultural production serves the status quo, and that any oppositional cultural production is futile, as it takes energy away from real revolutionary acts and can always be co-opted by capital and industry. It's a release valve, maybe, but not much more. Seeing all these one-time shocking, underground icons reduced/elevated to glam devotional objects, available for purchase, somehow served to underline the futility of revolutionary cultural production. 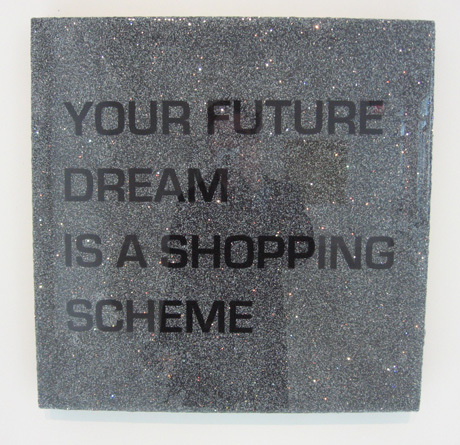 "Your future dream is a shopping scheme," indeed. What a dreary thought. These ideas bouncing vaguely about my head, I walked out past the Angus Fairhurst gorilla, more snow-back than silverback, to the ice bar to purchase an $8 beer. (I should point out here that even Microsoft Word seems to think that "$8 beer" is a typo.) "Cheap dialogue, cheap essential scenery," perhaps, though somehow I doubt an outdoor bar carved of ice is cheap, or essential. It is pretty remarkable, though, like so much of the surroundings at Chambers, as well as seductive and fun. Just like seeing one's reflection in one of Stanislav's wall pieces, it all leads to feeling complicit in this production of desire and consumption. It's an uncomfortable sensation, and like Johnny Rotten in "Holidays in the Sun," it's enough to make you want to climb over the wall. Or, to see if there's enough cash left for a scotch, inside with the outsiders. They pour them pretty generously.